For Season 6’s fifth Last Chance Design Lab challenge sponsored by CND, Bojana Radojicic and Jenna Jupin will battle it out one-on-one to see who has a chance of staying in the competition. CND’s Jan Arnold will select her favorite look Friday and you’ll find out who will remain for at least one more week. Since Bojana packed her paintbrushes after NSI’s Feeling Festive challenge, this week’s Last Chance challenge is loosely related. 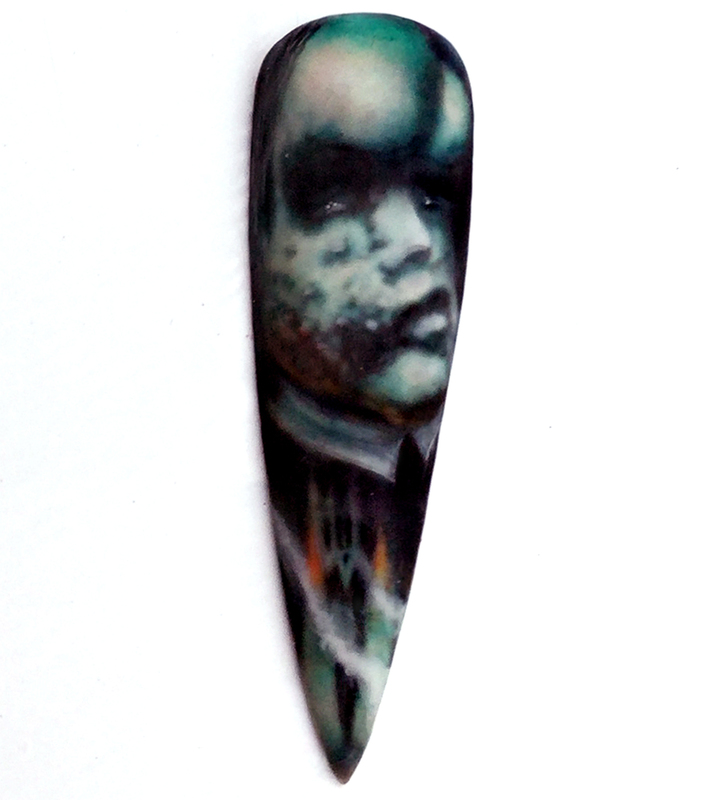 Sideshow: Hand paint your favorite carnival oddity on a single nail tip. A freak show is an exhibition of biological rarities, referred to in popular culture as “freaks of nature.” Typical features would be physically unusual humans, such as those uncommonly large or small, those with both male and female secondary sexual characteristics, those with extraordinary diseases and conditions, and others with performances expected to be shocking to viewers. During the late 19th century and the early 20th century, freak shows were at the height of popularity. My inspiration was American Horror Story: Freak Show. I chose to paint Bette and Dot Tattler, conjoined twins who were recruited by Elsa Mars as new members of her troupe of freak performers. It’s not my favourite oddity, but it’s close to me, because I also have twin sister. I painted Joseph Merrick, a man with tumors, who suffered years of mistreatment. I chose to paint it very dark and matte, because that’s how his story is and he lived most of his life in dusty dimmed light. Stricken with poverty and beaten by his father every day, he ran away and joined the only place that would take him with open arms: The circus. Depicted as half man, half elephant, poor Joseph was displayed as a freak in front of vast crowds. For years he was the main attraction of the Gaiety Palace of Varieties, where he was valued as a living freak and not a young boy. Victorian surgeon Dr. Frederick Treves saw past the monstrous facade to find the sensitive soul of an intelligent individual. He offered Merrick a life of care. He he had a somewhat decent life at the hospital, until he died because his neck couldn’t hold his head any longer. While his 27 years of life were marked by cruelty, exclusion and inhuman treatment, Merrick’s story is a reminder that the world is desperate for more compassion towards people who look different. Stay tuned as a winner will be announced later this week. Congratulations to Jenna Jupin for winning the fifth Last Chance Design Lab challenge of Season 6! Jenna went up against Bojana Radojicic to show us what she loved most about herself. CND’s Jan Arnold chose the winner.